Did you know much about Alfred, Lord Tennyson before you illustrated his poems? The first 8 years of my life were spent in a Scottish mining village, the next 13 in Vancouver Canada. Neither location was very much concerned with poetry and my education was pretty basic. That all changed when I came to London in 1968 and fell in with a group of very aesthetically minded students from Hornsey art college and the Northern Poly. They swept me up in a great tide of romantic high Victorian culture which was so much in the air in those days. 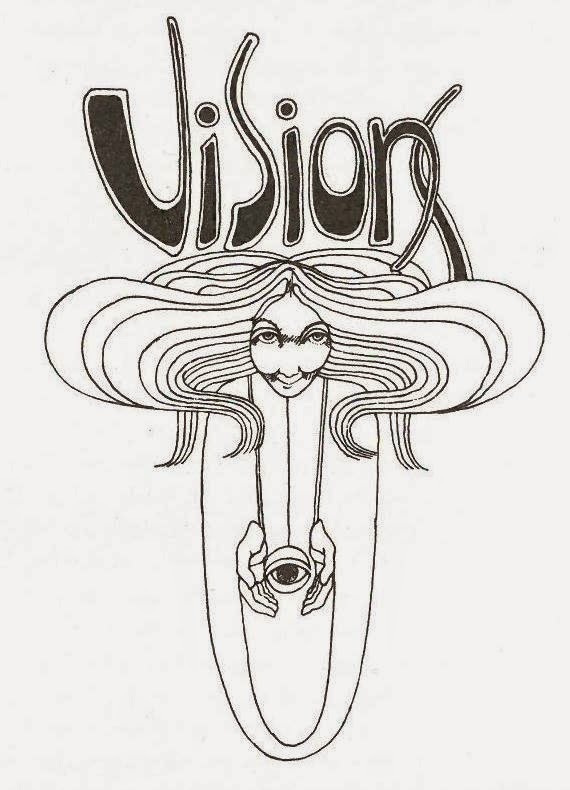 I had been exposed to pastiche Victorian graphic sensibilities in the form of sub-Mucha psychedelic posters which were everywhere in my frequent visits to San Francisco in the mid-sixties but now in the company of these newly graduated students my real education began. Every weekend was spent exploring 'architectural wonders' and locations of Art Nouveau interiors and architecture such as the Blackfriars pub and the Queens pub in Hornsey and many, many more. 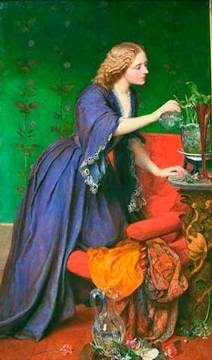 Pre Raphaelite paintings were just emerging from Art Gallery basements, Portobello Road was being scoured for art nouveau relics. Biba and many other boutiques provided flowing Pre Raphaelite garments for the numerous '60's equivalent to the Brotherhood's 'stunners', and stunners they were. 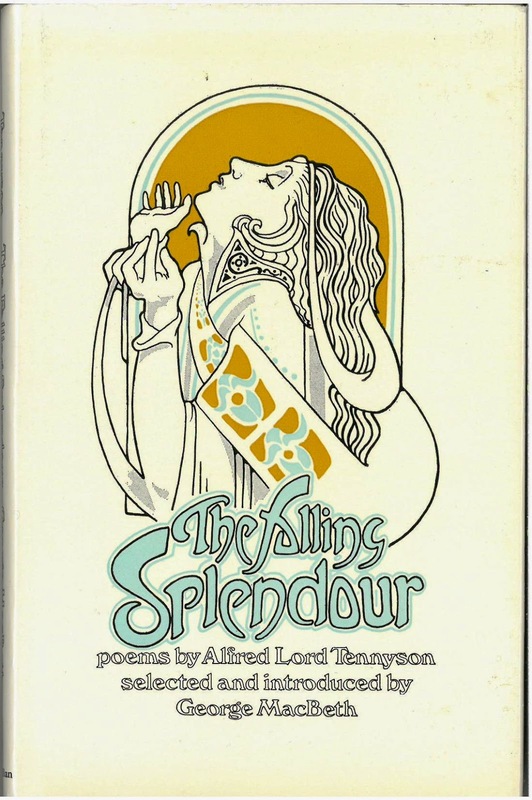 People weren't afraid to quote and read poetry in pubs and certainly Tennyson was one of them and certainly I was smitten by more than one sultry Lady of Shalott. I put together an illustrator's portfolio and my real life had begun. I was fortunate enough to become acquainted with Antony Ballantine, a tutor at the Northern Poly and a great collector of art nouveau and Roderick Gradidge, chairman of the Victorian society. As I said I put together a portfolio, walked into the art director's office in MacMillan's and walked out with a commission to illustrate Tennyson. It was all so easy, my career had started and it never stopped. MacMillan's are still one of my main clients although these days it's for Caribbean text books. Did you choose the poems you illustrated? Were there others you wanted to do? Yes. As I recall I was only required to do a certain number. I would happily have illustrated them all. I especially love your figure for The Lady of Shallot. Was The Lady of Shallot as popular then as it is now? How did you chose the moment to illustrate from such an action packed poem? Yes she was. It's getting on for half a century ago so I can't quite recall why I chose that scene. To tell you the truth, looking at it now I see mistakes and I'd love to do the whole thing again. Both you and David Sparling, who produced a Tennyson book cover in the early 1970s, produced album cover art. 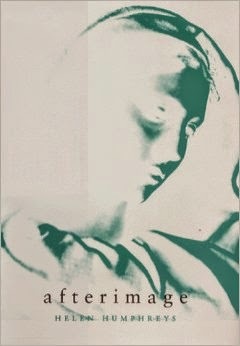 Do you see a link between Tennyson and music at the time? Donovan's 'Jennifer Juniper', (and pretty much everything else he did). Nick Drake's 'River Man' (this more than any other) - you would love it I'm sure. Simon and Garfunkel's 'Scarborough Fair'. Jefferson Airplane 'Triad', full of smoky, menacing, dark sensuality. Country Joe - 'Porpoise Mouth' full of Pre Raphaelite jewel like imagery, I insist you download a copy and listen to this, it could have been written by Tennyson - he would have loved it. What’s your favourite Tennyson poem? 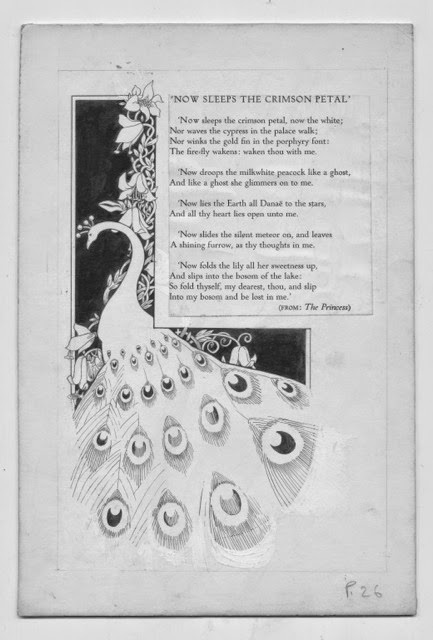 I was delighted to find out that Robin’s favourite poem was the same as mine and the white peacock illustration is just perfect. To know more about Robin’s work, have a look at his website here. Many, many thanks to Robin for his patience and replies, and I can only encourage you all to seek out copies of The Falling Splendour to admire for yourself. 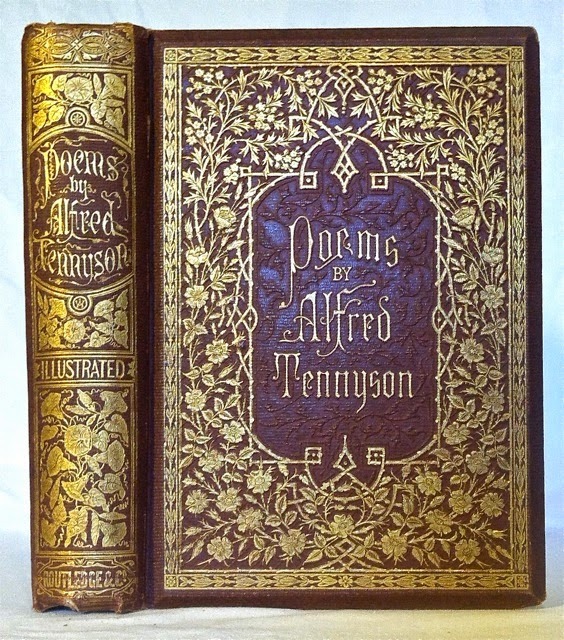 Poems by Alfred Tennyson (1857), more commonly known as the ‘Moxon Tennyson’, used a mixture of traditional artists and the new artistic upstarts, the Pre-Raphaelites. 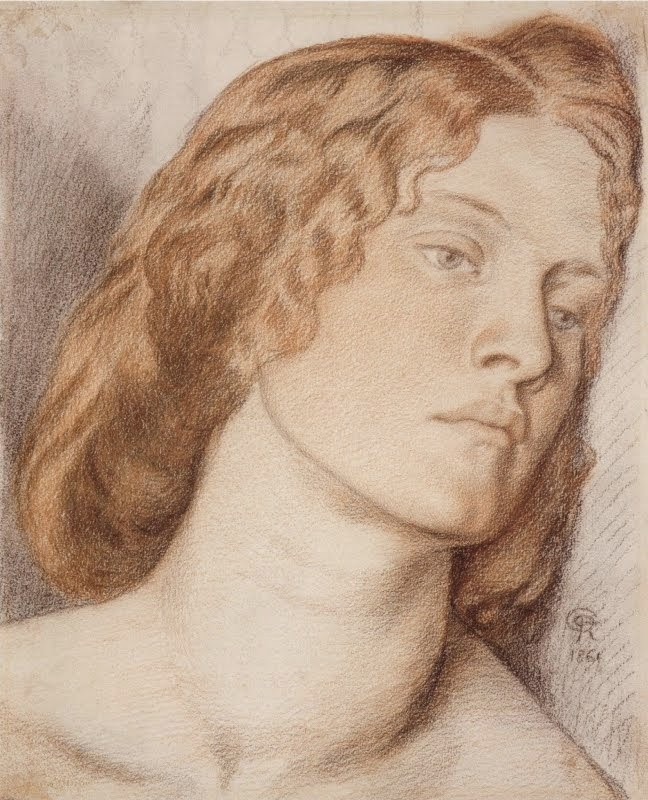 Despite its troubled production history (Rossetti’s difficult behaviour is reputed to have contributed to Moxon’s death), it provided some iconic images and demonstrated a new sensibility in book illustration. 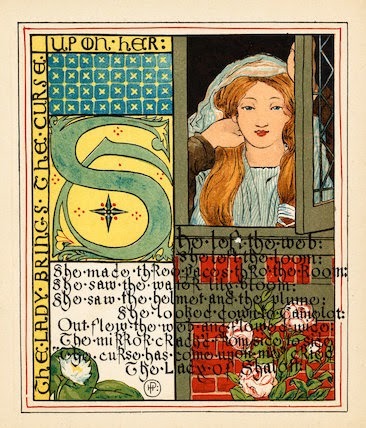 Whereas ‘traditional’ artists, such as Thomas Creswick, illustrated a poem on a facing page in an open, borderless format, the Pre-Raphaelite contribution was set in the text of the poem, inside frames. The images are tightly focused, richly detailed, figure-centric, and some were later turned into paintings by the artists. 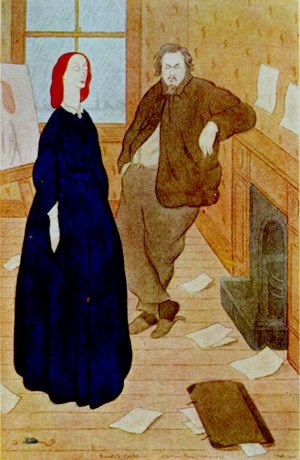 Tennyson had reservations over artists illustrating his works. He did not feel the need for others to interpret his words, certainly not with any interpretation that did not match his, and actively disapproved of certain illustrations. 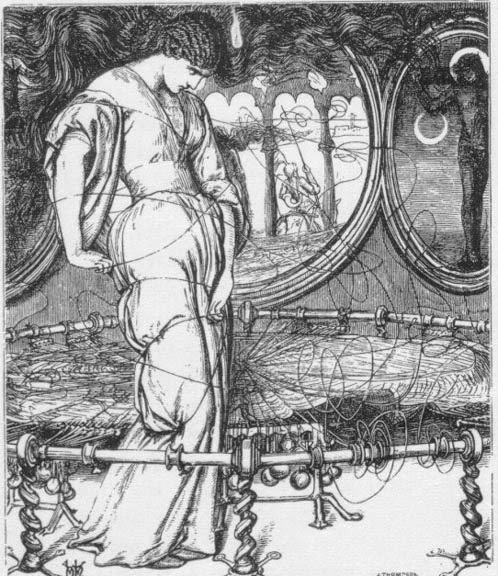 He disagreed with the way that Hunt had illustrated The Lady of Shalott saying that an illustrator 'ought never add anything to what he finds in the text'. Next to Daniel Maclise’s illustration in his own copy of the 1860 edition of The Princess, the poet wrote ‘wrong!’ emphatically. In ‘A Statement of Facts Respecting the Illustrated Edition of My Poems’, quoted in his letters, Tennyson opened the floodgate on his frustration and disapproval on the way his works were interpreted and his inability to stop others from using his poems in whatever way they choose (a cry, even now from writers, for example Anne Rice and Lestat). Still, Tennyson could not stem the public hunger for visual interpretations of poems, illustrated books and, specifically, his work, which meant that it was merely the beginning of a tidal wave of such publications. While too numerous to list here, there were many illustrated editions that followed the 1850s publications. What also seems to have followed too is the often innovative and unusual nature of the works, as if the nature of Tennyson’s poems gave artists the freedom to experiment with style and subject. 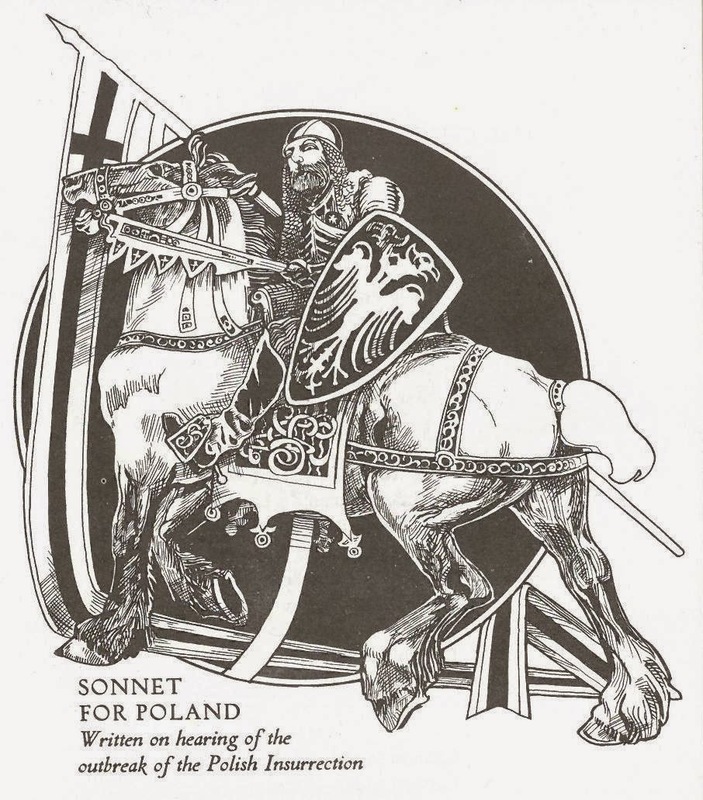 The American illustrator Howard Pyle combined the words with the image, making them almost illegible, but of course the audience would know them off by heart. 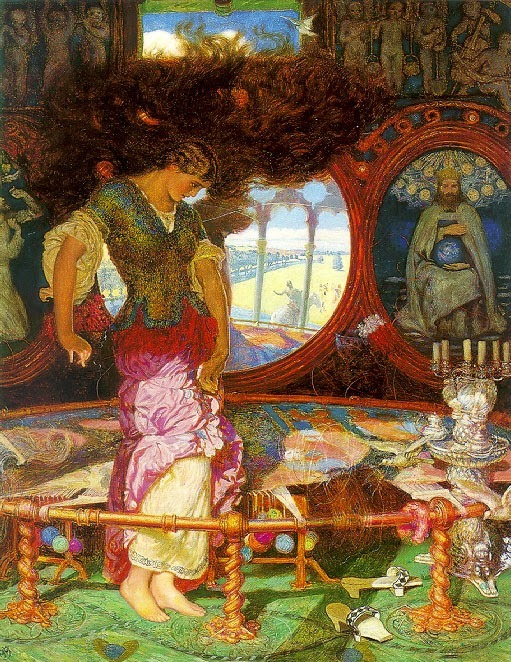 The woman looking out of the window doesn’t look particularly concerned that the doom has come upon her, when compared with Holman Hunt’s swirl-haired damsel, but was equally as innovative in terms of artistic style. 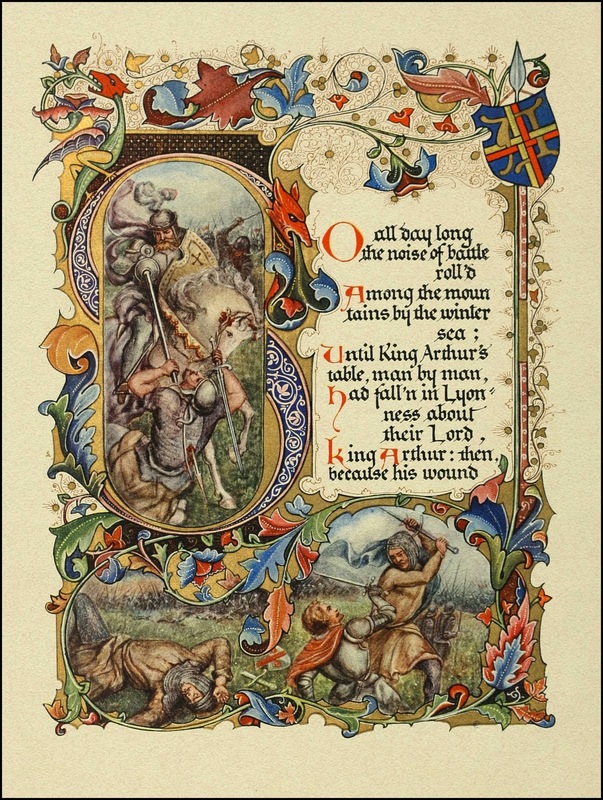 Pyle’s work was one of the more ‘medieval’ style illuminated manuscripts, including L. Summerbell’s The May Queen (1872) and Alberto Sangorski’s Morte D’Arthur (1912), securing the poet's place in the Gothic, the alternative, the anti-industrialisation of Victorian England. This position was arguably somewhat at odds with his role as the official establishment poet, becoming Laureate in 1850 and finally accepting a peerage in 1883 (after refusing a baronetcy twice in the 1860s). 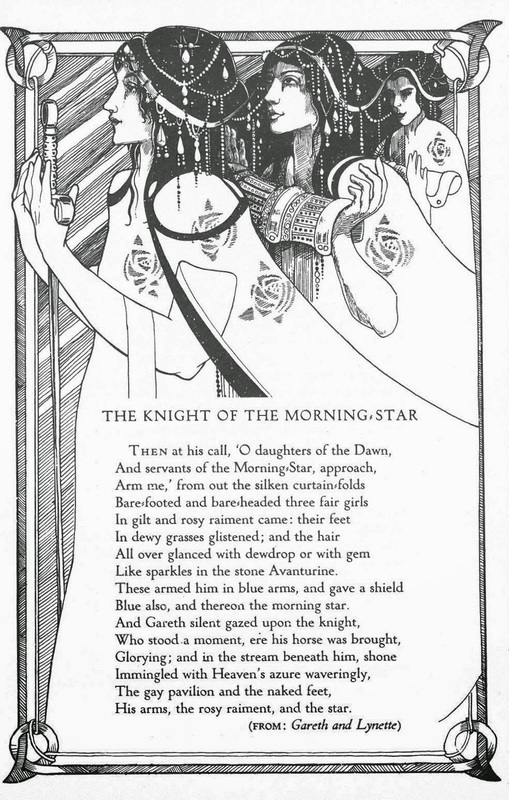 I have always admired the 'feminine' in Tennyson’s works and so it is hardly surprising that he appealed to so many women illustrators of the period. 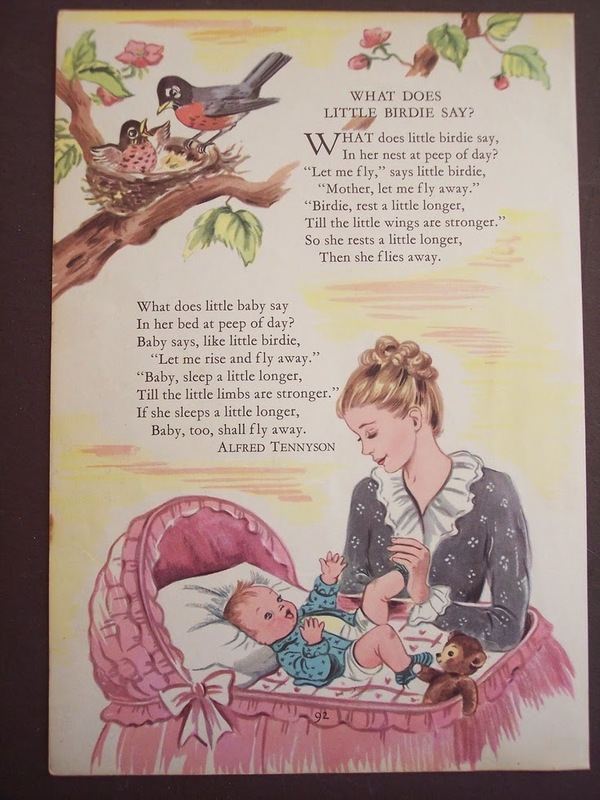 Jessie M King, Eleanor Vere Boyle, the Taylor Sisters and Florence Harrison were just some of the female artists to produce work for illustrated editions. 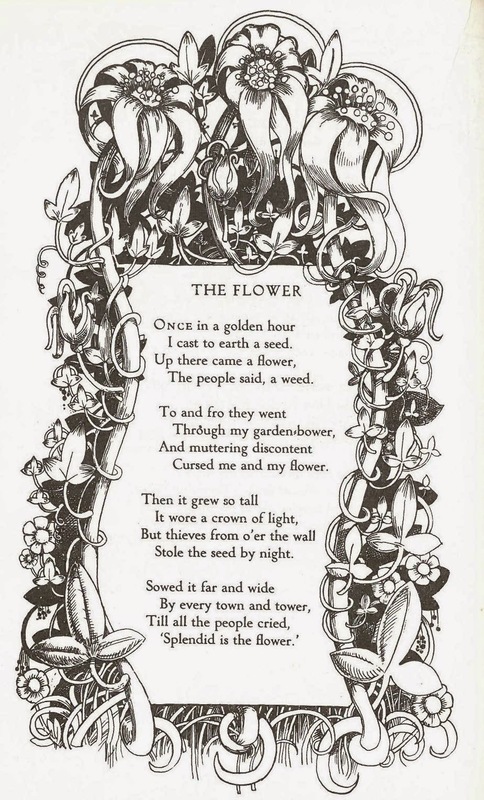 If you can remember back to my posts on the ‘Endymion’ edition of Tennyson’s works, Eleanor Fortescue Brickdale produced some innovative and striking illustrations for a collection of his poems and then also Idylls of the King, in lavish colour for an Edwardian audience. 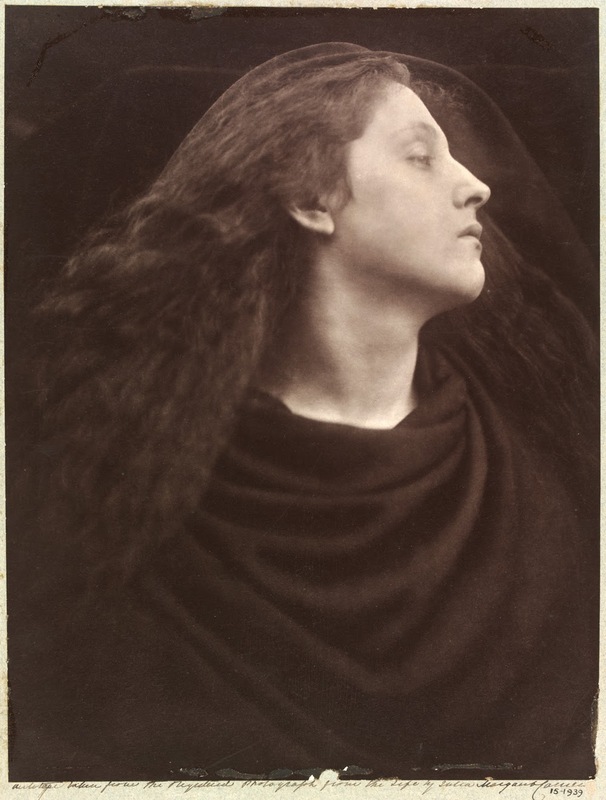 Even Julia Margaret Cameron, friend of the poet, allowed her photograph of Maud to be engraved for volume ix of Henry S. King & Co cabinet edition of the poet’s works, although she was very disappointed at the scale and quality of the reproduction, which in turn encouraged her to produce her own large scale edition of the poems, almost a third larger in size of King’s cabinet edition. 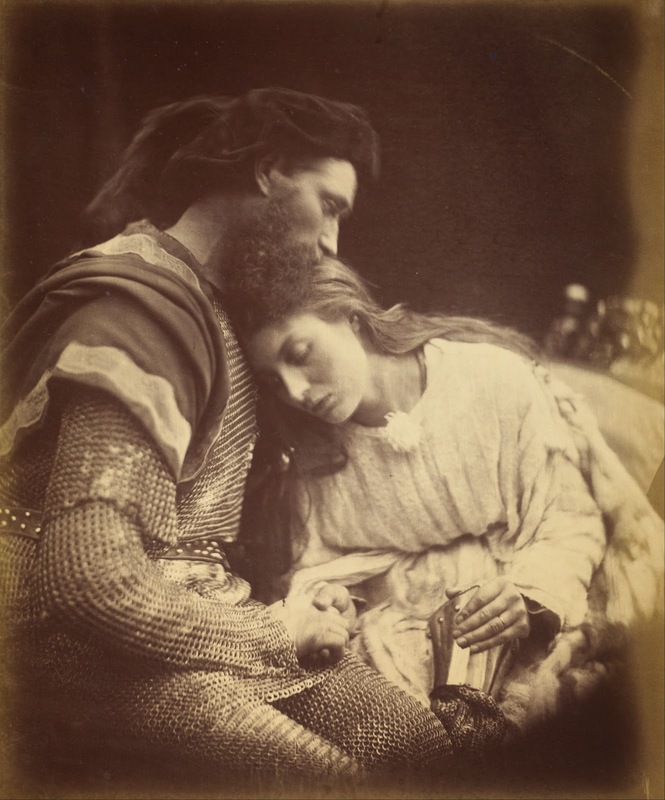 Held dear by some into the twentieth century, there is no denying that Tennyson’s popularity, like that of the Pre-Raphaelite artists with whom he was so closely associated, waned. 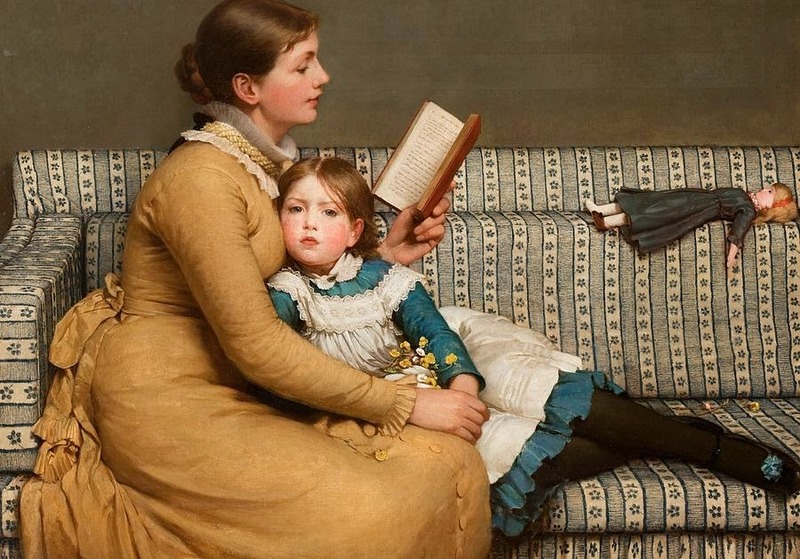 All things Victorian fell from fashion, and for many people who grew up between the First World War until the end of rationing, Tennyson was something you might have learnt at school, but was not a joy. Occasionally, he appeared in cloying versions such as this one below, but he was no longer seen as relevant to the New Elizabethans. The 1960s changed that. In the opening of his 1966 ‘Literature in Perspective’ book on Tennyson, J B Steane acknowledged that mention of the poet provoked ‘a wry smile, an ironical lift of the eyebrows, or their stern depression into the frown that signifies critical disapproval and dismissal’. However he was hopeful of a re-examination of the poet’s work with fresh eyes and a view that Tennyson was relevant and ‘abiding’. Turns out, he was not alone in this conviction. In his introduction to The Falling Splendour of 1970, the poet George Macbeth likens Tennyson's qualities of mystery and exoticism to the music of T-Rex. 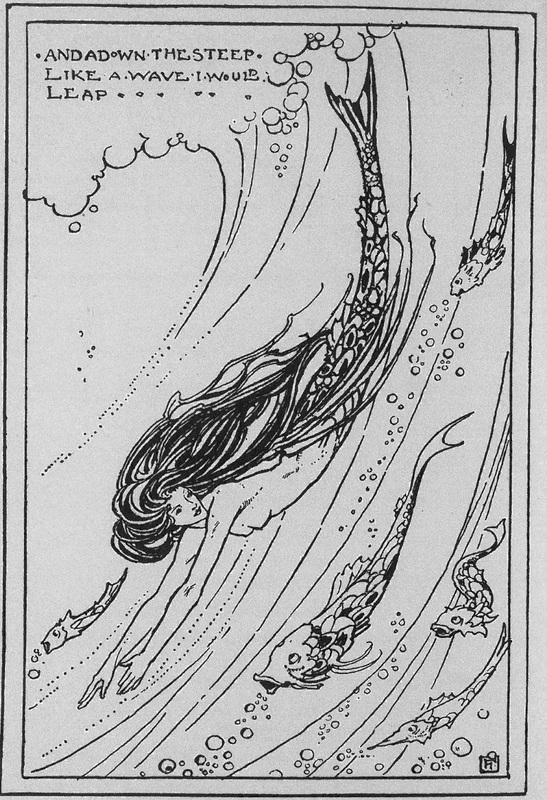 The illustrations by Robin Lawrie are an art nouveau whirl of hair and drapery, perfect for the Biba-generation. 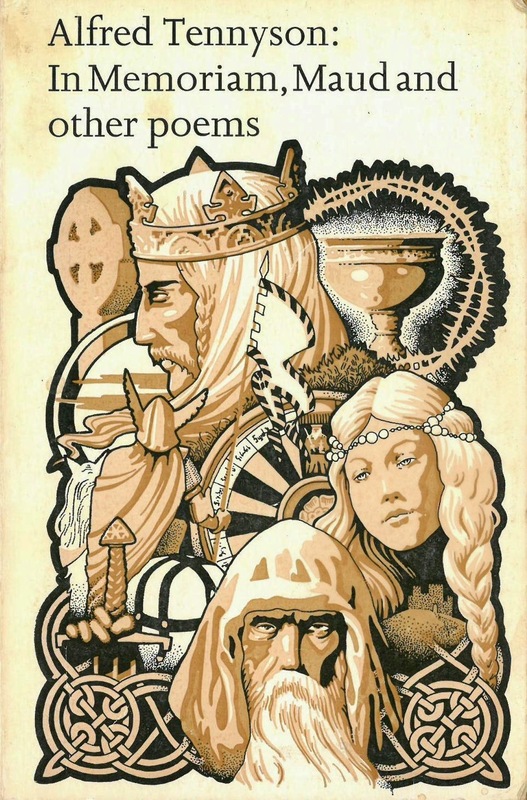 Likewise for John D Jump's 1974 edition of In Memoriam, Maud and Other Poems, the cover art, by David Sparling, looks like a Prog Rock album cover, unsurprising as the artist was better known for album covers and OZ magazine illustrations. 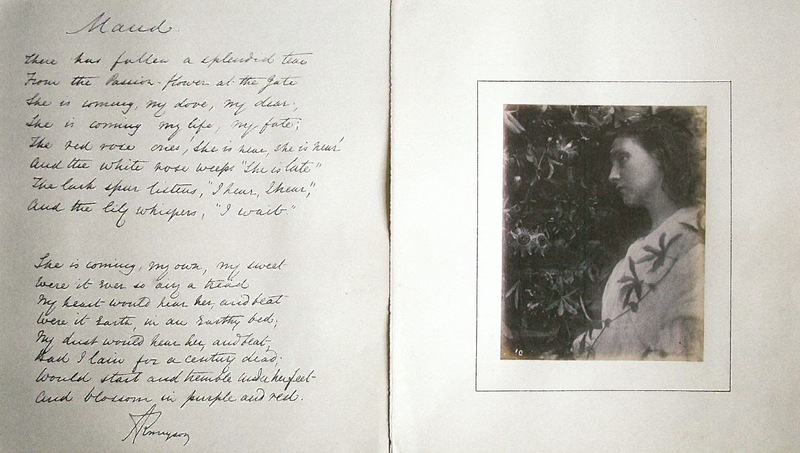 The rediscovery of Tennyson's poems in the 1960s was enhanced by Christopher Rick's annotated edition of Tennyson's poems in 1969 and subsequent critical study a few years later, together with grandson Sir Charles Tennyson's reminiscences broadcast in 1969. Since then, there has been no holding back the poems from the artistic imagination and strongly coupled to this seems to be illustration. In writing my thesis for my Masters around 10 years ago I amassed quite a collection of editions of Tennyson's poems, all illustrated. 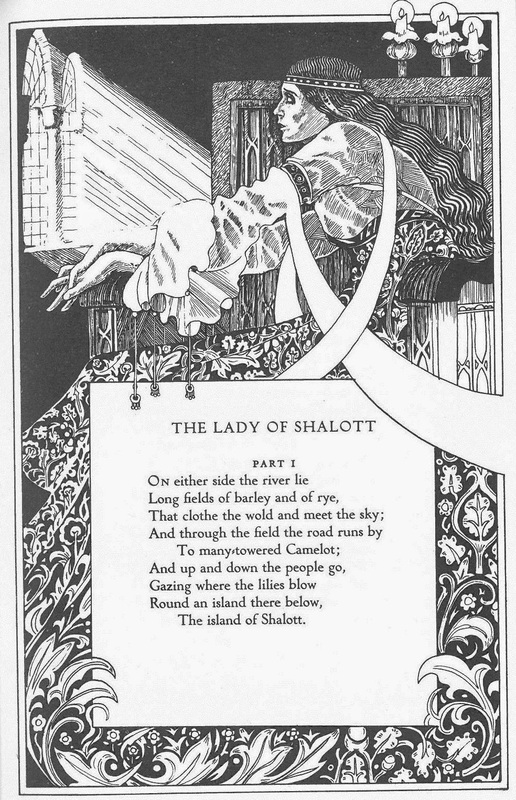 From reeditions of Gustave Dore's Idylls of the Kings, now looking like a grim graphic novel, to Charles Keeping's 1986 edition of The Lady of Shalott, the books keep coming. 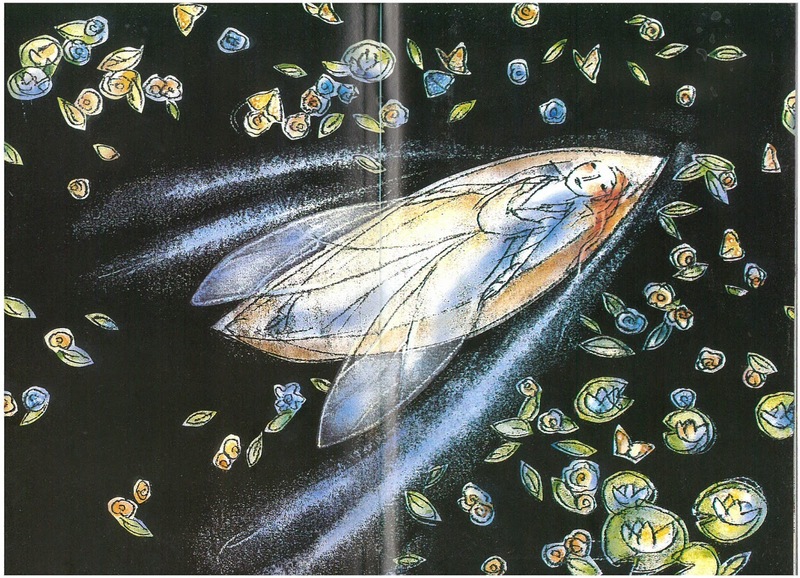 One of my favourites remains Geneviève Côté's The Lady of Shalott (2005), who uses the boat as a cocoon in which the crysalis-figure of the Lady 'metamorphoses into a beautiful butterfly' (from the book's appendix). More editions of Tennyson's work will come, no doubt, as it seems no-one's poems conjure visual interpretation quite as much as Tennyson's. I'm not sure that would have pleased him, yet I believe it is why his poetry remains so fresh and relevant to us today. 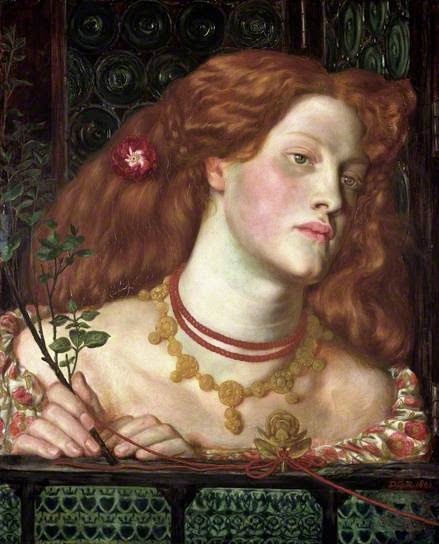 Painted in the year between his marriage and the untimely death of Elizabeth Siddal, Rossetti chose to paint one of history's most famous mistresses. If we believe that a main concession in the Rossetti marriage was that the artist would forgo his mistress models, then this is somewhat a slap in the face to the ailing Elizabeth. Many people don't like this picture of Fanny due to her high colour. It is a very strong interplay of red and green, like a rose and its foliage. In fact roses cover the canvas, from the glass, the pin in the windowsill, the necklace, her dress and the actual bloom in her hair. Even the bottle-bottom glass behind her echoes the round of the rose. She is a woman in full bloom, she is a flower in a garden. On the other end of the silken cord is the object of her desire, the king, as shown by the heart and crown motif. However the queen also wears a crown, and the legend says that the mistress was doomed to be a cut flower, by the hand of her lover's wife. 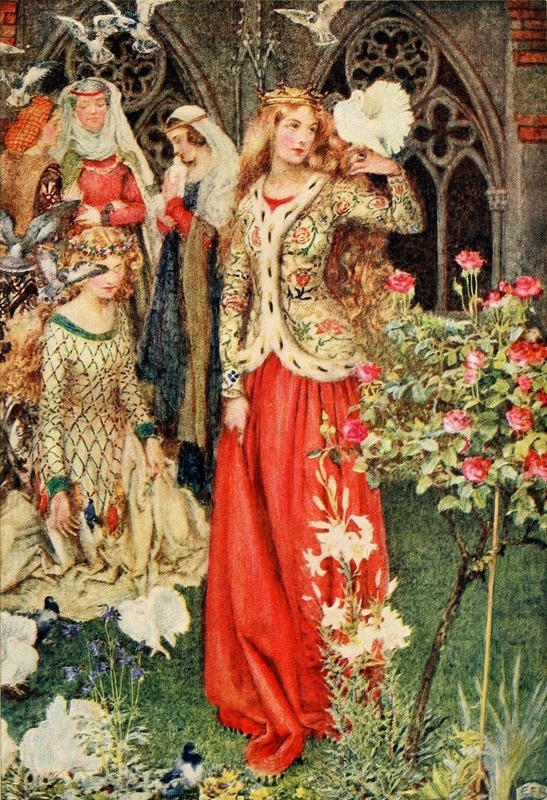 Fair Rosamund, or Rosamund Clifford was the daughter of Walter de Clifford, a lord from the boarder counties between England and Wales. The family changed their name from 'Fitz Richard' (son of Richard) to that of their home, Clifford Castle, on the River Wye (lovely part of the world, for those who have had the pleasure of visiting). She was the mistress of Henry II, and as such her life became somewhat dappled by fantasy and romance. In truth all that is vaguely known is that she was born around 1150AD and she died c.1176AD, possibly in Godstow Nunnery, after the end of the affair. Well, that isn't very exciting now, is it? 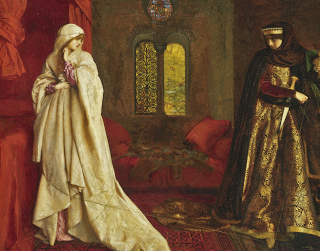 As you can see from de Morgan's painting above, nothing spices a story up like witchcraft, a wronged woman, a poisoned chalice and a doomed, innocent, pretty heroine. Throw in a secret love-nest in the centre of a maze and a silken cord for the lover to follow and you have a corker of a story. I love how the tiny winged babies of love are floundering around on the floor, fleeing the serpents of black magic. Queen Eleanor's dress resembles scales, like a serpent, and she reaches towards the window which shows Adam and Eve embracing in the garden of Eden. Hang on, is de Morgan saying that the King and his mistress are the innocent party and the wife is the serpent? That the love between the King and Rosamund is more pure and sacred than the love between husband and wife? 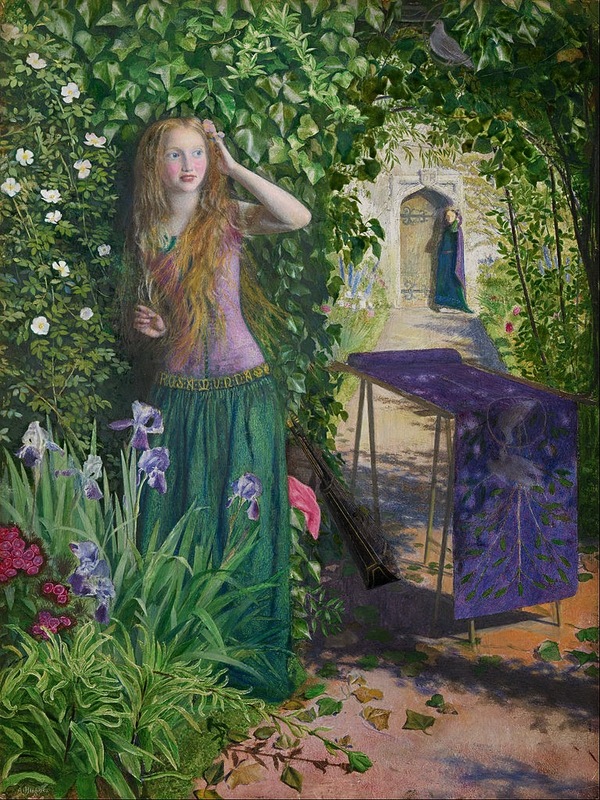 So the legend of Fair Rosamund goes that King Henry loved this beautiful girl and in order to hide her from the nasty Queen, he built a maze at his home at Woodstock and placed her little house in the centre. Only he could find it, by use of a silken thread that led through the maze. 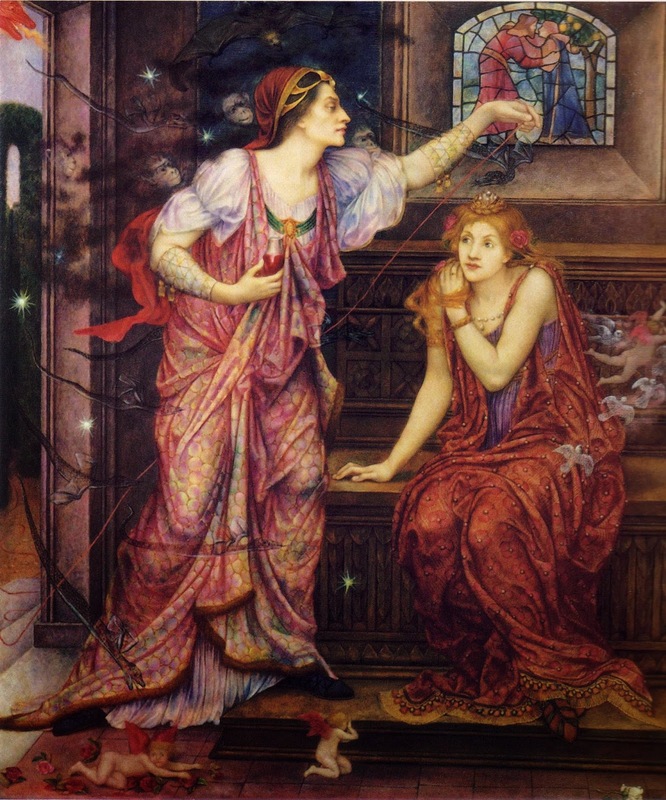 All Rosamund did all day was wait by the window, by her silken thread and await his kingly presence. One day however it wasn't the king that followed the thread it was nasty Queen Eleanor of Aquataine. The Queen confronted her rival and gave her the option of a dagger or a chalice. 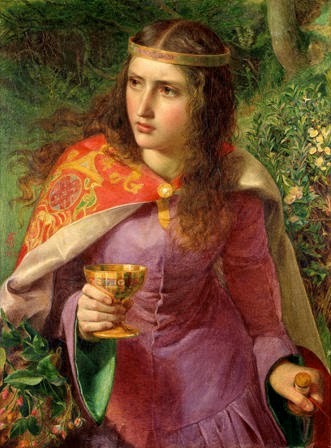 Rosamund chose the chalice, drank the poison and died. 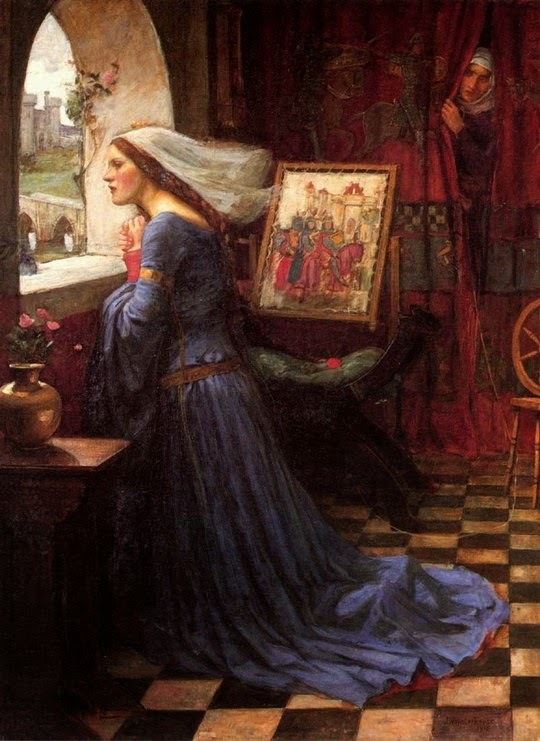 First of all, the cloistering of a lover in a remote place, leaving her to just wait and wait has echoes in other romantic stories, such as Elaine of Astolat. 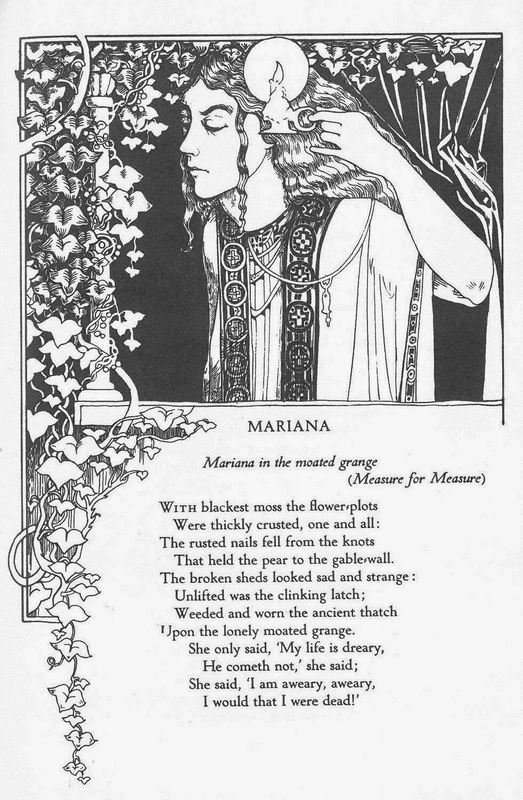 For the Victorians too, there were overtones of Mariana in her moated grange waiting, waiting for a man to come. Waiting is a very feminine act, that of inaction, passivity, obedience, possibly the very virtues you might want in your mistress. Or spaniel. Stay! 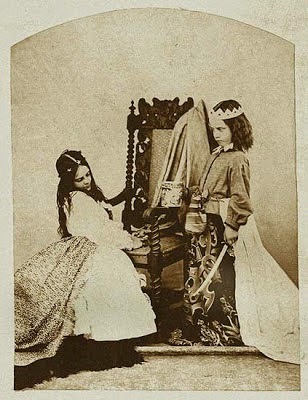 From the straight forward story of a young royal mistress who had a couple of illegitimate kids and died reasonably young, it was spun up into a fairy tale. 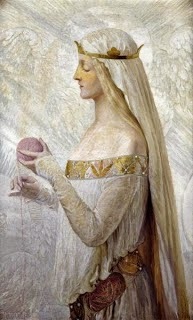 It is unlikely that Rosamund was the only mistress, although by all accounts she was a favourite for whom he allegedly wished to leave his wife. This, coupled with Rosamund's early death, seems to have led to the stories that Eleanor (a capable woman in her own right) had murdered her rival, even though we now believe that the King and Queen had been leading seperate lives since the birth of their final child. That's not such a good story though, is it? 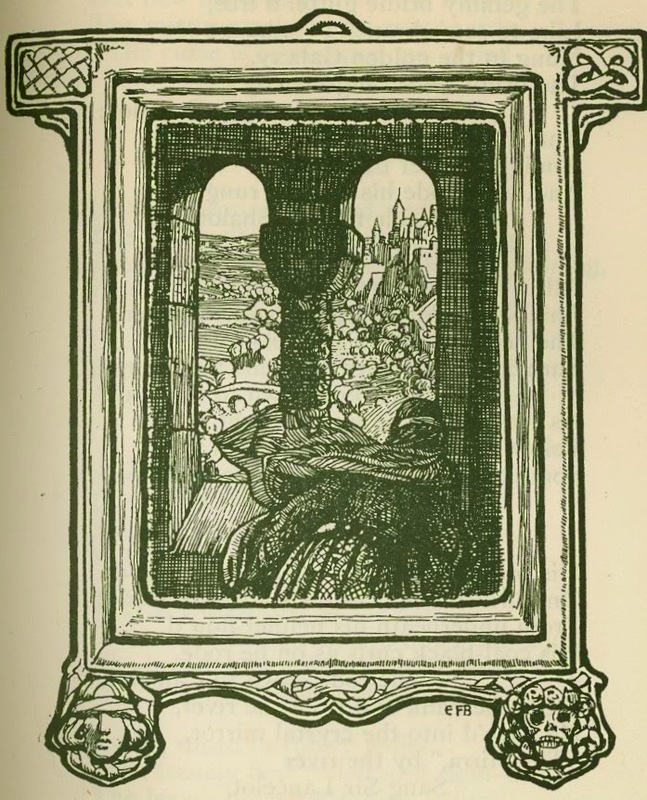 In most Victorian portrayals of the story, Queen Eleanor is a bit of a crone, lurking much like the wicked stepmother in Snow White, waiting to poison/stab the fairest in the land. Sandys image of Eleanor as a troubled, beautiful woman, preparing to sort out her rival, is unusually sympathetic. She would have been in her late forties by the time of her husband's dalliance with Rosamund, yet in Sandys vision she is young and beautiful. In a way, siding with the Queen against her husband's adultery seems a far more natural Victorian position, but he is definitely on his own. Love the cloak, reflecting a Book of Kells aesthetic before the Celtic Revival had taken hold in British art. 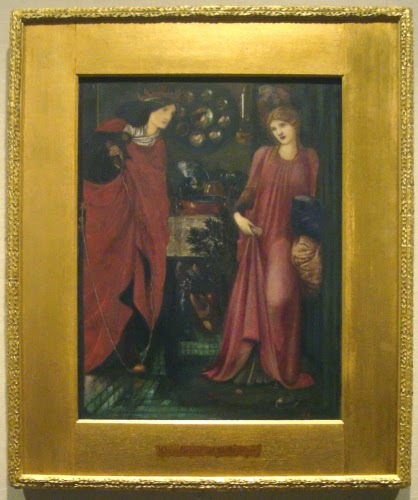 Burne-Jones did two versions of the confrontation between mistress and murderous queen. In both, the queen is dark, powerful and in control (and looks a bit like Jane Morris), whereas Rosamund is caught, cornered, doomed. 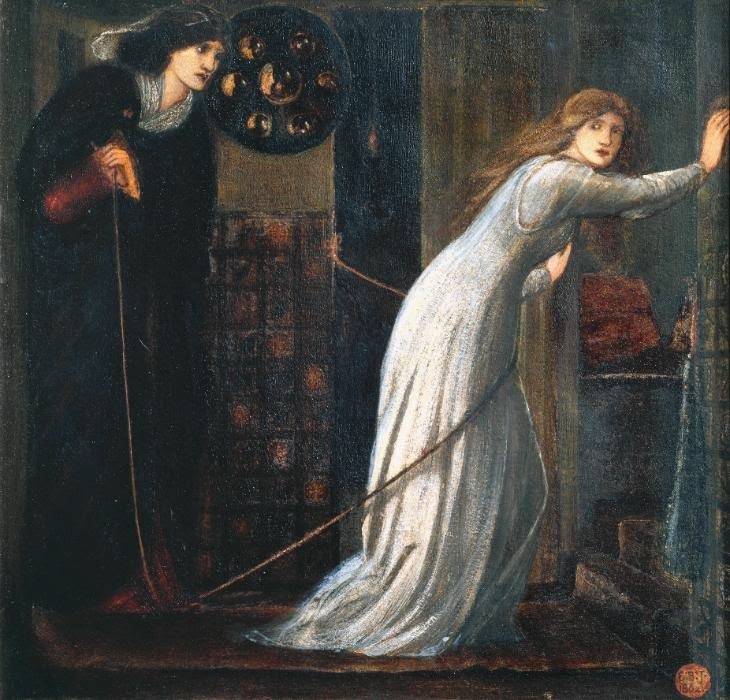 In the second image Rosamund is literally caught in the cord that would lead her lover to her. Still going strong in the 20th century, Cowper gives us Eleanor, armed with a knife, reeling in the feckless Rosamund by her lover-cord. I love the contrast between the impractical, endless white of Rosamund's cloak and the rich damask of Eleanor's frock. As in many of the images above, Eleanor seems quite practically dressed, her cloak and hood almost masculine in their functionality. Rosamund seems hampered by her acres of cloak. She's not escaping. It is interesting what minor characters of history get immortalised as romantic heroines. Of all of Charles II mistresses, for example, Nell Gwynn has a mythology around her that surpasses even Barbara Villiers. These days we know far too much about the sexual exploits of the high and mighty so we don't need to conjure tales about them, or if we did they would be quickly dispelled by the avalanche of fact or publicity. Almost a thousand years ago there were stories told word-of-mouth, people trying to make sense of the disparate facts and weaving them into a narrative. 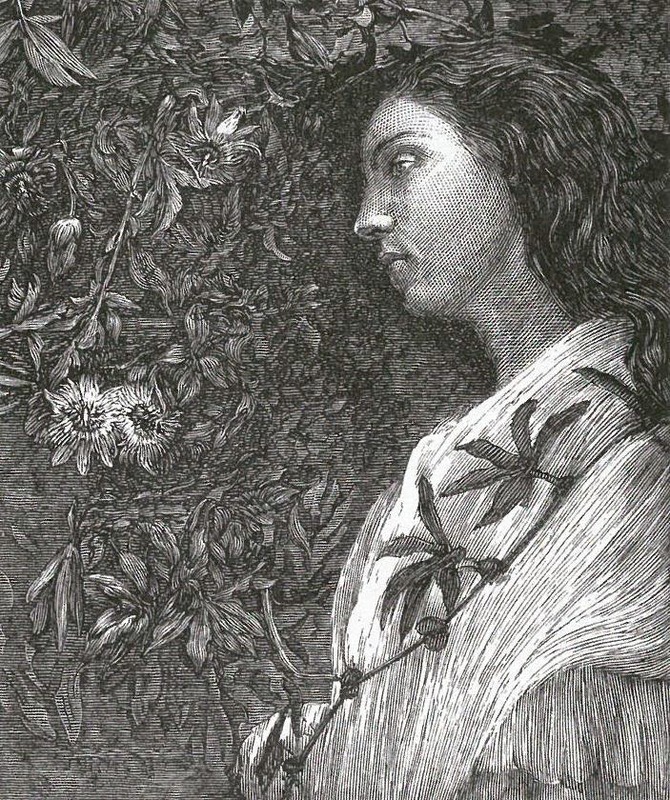 The silken cloth used in Rosamund's burial became known as a silken cord, a trysting place in the complex garden at Woodstock became a maze with a love-nest in the centre, all building towards a fairy tale with a real twist. For the Victorians it seems the romance of the legend was far more beguiling than the rather more mundane truth. And my goodness me, didn't it make better paintings? 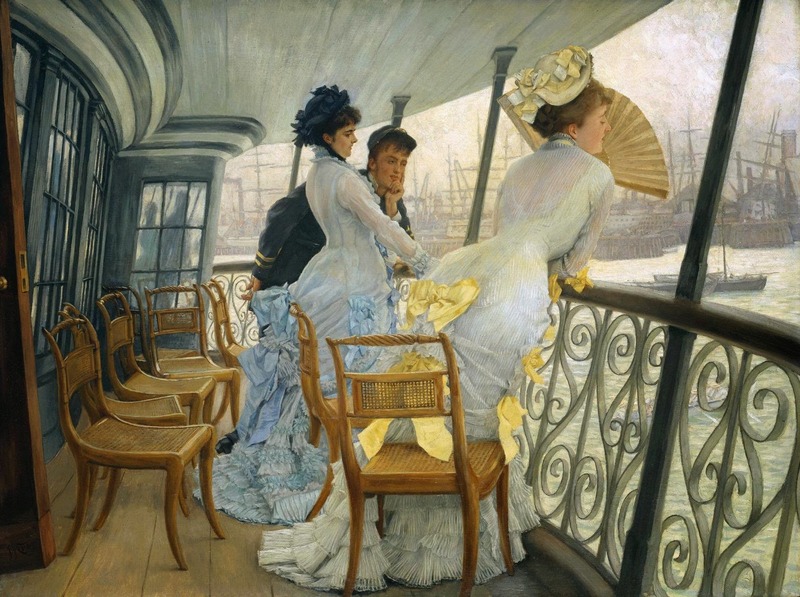 Reflecting the broadening in horizons of middle class women in the late 19th century, the freedom of dress liberated them from the clutch of the corset. 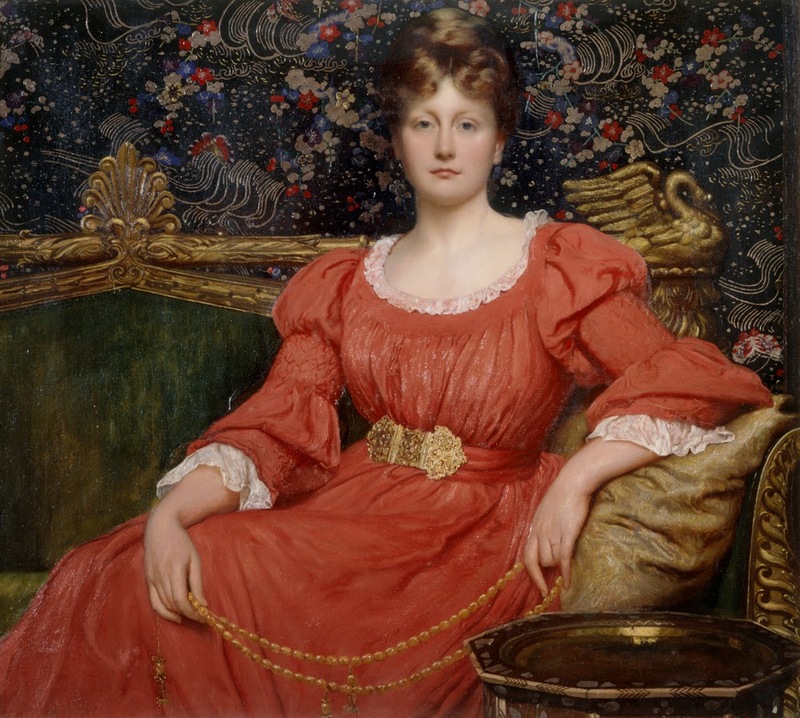 Linked to the appreciation of beauty, central to the Aesthetic movement and stemming from artistic dress of the 1850s and 60s, women who aspired to aesthetic perfection could wear flowing, smocked silks, gathered only with belts or decorative stitches. I'm in Portsmouth three days a week and it never looks like this. The exhibition opens with this beautiful painting of young, glamorous women with perfect hour-glass figures whipped into foamy bustles. The woman with the yellow bows looks like you could snap her in half. From her throat to her hips, the dress is skin tight and restricting making the woman decorative but not exactly useful. 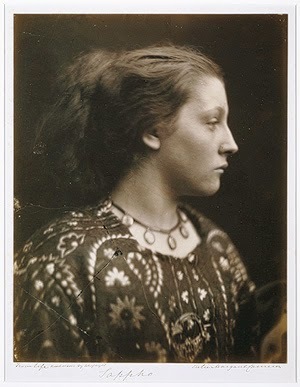 In the 1840s, George Frederick Watts saw Virginia Pattle in the street and fell in love. 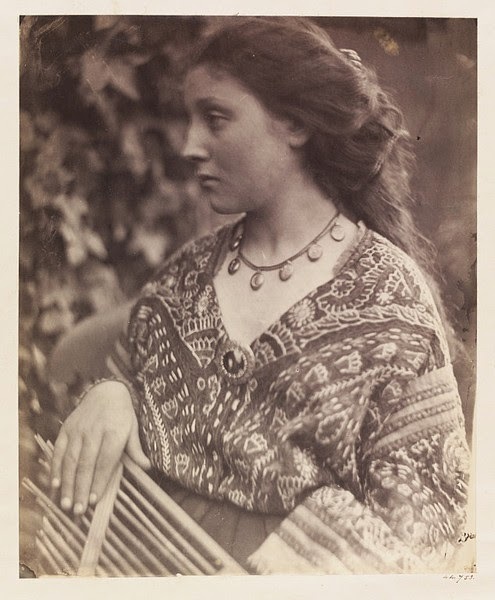 Virginia and her sisters (including Sara Prinsep, Sophia Dalrymple and Julia Margaret Cameron) had returned from India with different ideas on what to wear than the London Society they mixed with. Whereas fashion was for bell skirts and corsets, the sisters wore flowing clothes in soft colours, together with belts and bangles. 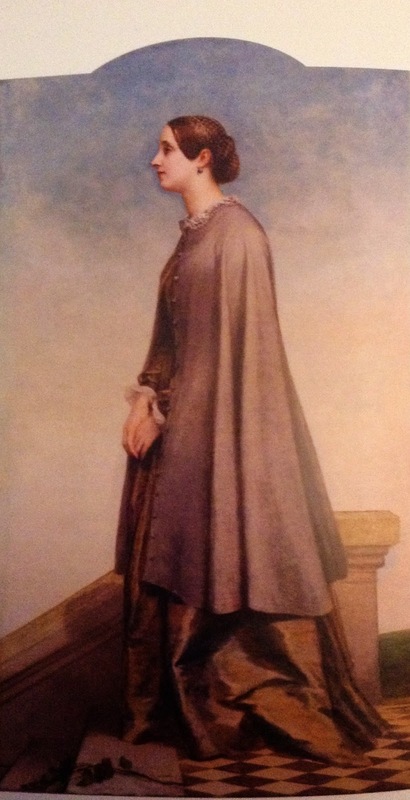 Watts' portraits of the sisters began an idea of artistic dress, taken up by Elizabeth Siddal in the 1850s. Rossetti's many images of his beloved Lizzie during the 1850s show her dressed in home-sewn gowns with softly gathered waists and unhooped skirts. Despite Rossetti's attendance at Sara Prinsep's home Little Holland House, Lizzie's dresses were arguably entirely her own invention. Later, Jane Morris' portrait The Blue Silk Dress showed the deep silk acres hung around her uncorsetted frame. 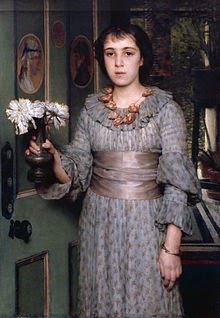 One of the highlights for me was seeing Watts' portrait of Mrs Nassau Senior, usually housed at Wightwick Manor. The vivid violet against the red chair and green wall are arresting, coupled with the delicacy of her face and the gold ripple of her hair. It is a love song to the beauty of fabric and everything in picture has detail and texture. The more you look, the more references to artistic dress can be found in paintings of the period. Alice in Wonderland has a mother wearing a fashionable gown with aesthetic detail, borrowing the style without getting its significance (rather like modern gangsta style). As the mainstream absorbed and blunted counterculture, so the ethos of freedom, health, art behind aesthetic dress was pressed aside in favour of a new cut, a different style but still corsetted, still restricted. 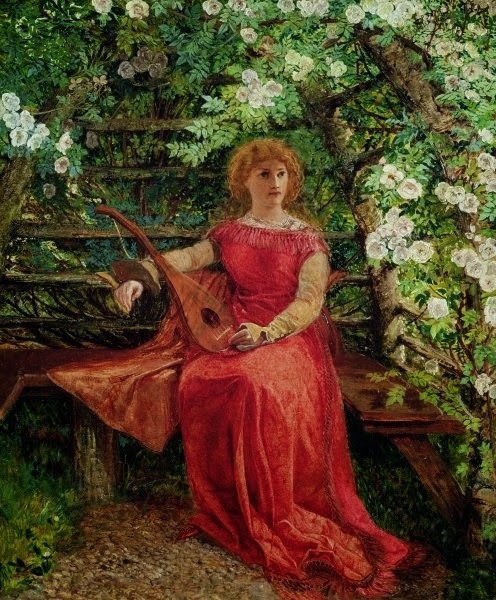 The Watts Gallery exhibition runs over two rooms and contains many beautiful paintings, together with photographs and the most beautiful silk dress from Liberty. I especially liked the Liberty adverts reproduced beside different paintings highlighting fashion accessories, such as Mrs Ionides wonderful 'waist clasp'. Accompanying the exhibition is a lovely little catalogue, full of wonderful pictures that compliment the exhibition and provide further information on the themes. At only £12.95 it is a bargain for the amount of detail it provides, as well as reproductions of all of the paintings on display. If you can't make it down to Compton then I recommend the catalogue wholeheartedly as a beautiful book in its own right. 'Liberating Fashion' is on at the Watts Gallery until June and further information can be found here. 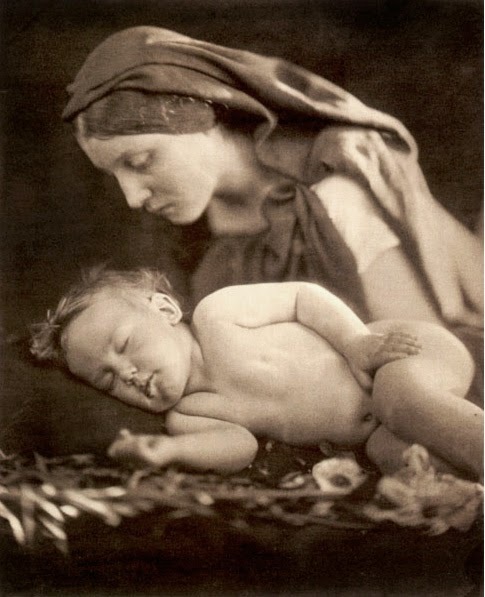 While it is easy to draw comparisons with Julia Margaret Cameron in Isabelle Dashell, Annie is an amalgam of the two Marys who worked in her household. The images that Humphreys so beautifully describe and which form the structure of the book, are taken from Mary Hillier, or 'Island Mary' as she was known to discern her from 'Irish Mary', Mary Ryan, later Lady Cotton. 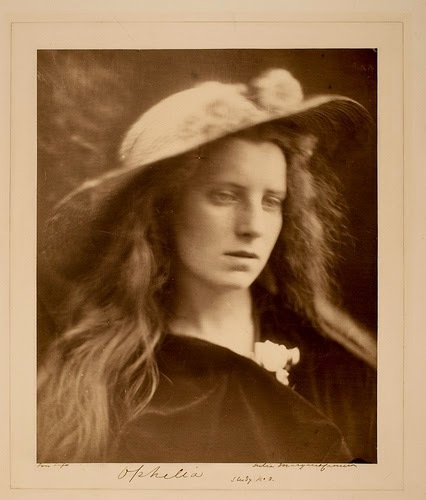 In Annals of My Glass House, Julia Margaret Cameron described Mary Hillier as 'one of the most beautiful and constant of my models, and in every manner of form has her face been reproduced yet never has it been felt that the grace of the fashion of it has perished'. Cameron had a habit of holding her model maids higher than contemporary society found acceptable, much as Isabelle Dashell presents Annie Phelan as a guest at her dinner party. The tension between how high the photographer holds her maid's beauty as an artist and the maid's place in the household is evident in the novel. Taken from the points of view of both mistress and maid, often switching between them within a scene, it is easy to feel sympathy with both women who struggle to understand each other while feeling a deep understanding. For Annie, she has the chance to be more than a maid, to be important to someone for the first time. For Isabelle, she has a complicated mixture of a friend, a child, and inspiration for her art. There is a gentleness to the story, a gradual building in tension, like a picture developing, until matters become serious. I loved the descriptions of how the photographs are staged, how unglamorous the moments are in order to produce something divine. For me, the most touching moments of the book are between Eldon and Annie, who he adopts as his fellow explorer. The scene where he wants to experience an arctic exploration by walking in frozen boots is both funny and tragic, and tells you everything you need to know about the man and the tenor of his life. His connection to Annie is equally as tenacious as his wife's, the dinner party scene showing the tension in their attitude to the maid and how at odds it is with the outside world. Although both Dashells are obsessed with the past, Isabelle with her scenes of classical literature and Eldon with the records of past explorations, both are committed to the future, a future expressed through the personal growth of Annie from maid to educated, opinionated young woman. Isabelle defends her art against her neighbour, Robert Hill, establishment painter who sees photography as a fad, a threat, the future he doesn't like. Eldon makes maps, first of exploration, then of conquest, of industry and commercialism. Photography and the fixing of image are very important in the story. Everyone has the photograph taken by the end, but not all by Isabelle. Her desire to control everyone's image, including her own, is a keynote for the book, and it is notable who she can't control and what happens to them. There is an elegance to Humphreys' prose that carries you through the novel. The characters have terrible stories inside them from Isabelle's babies, Eldon's childhood, the road that claimed Annie's family and what exactly happened to the other maid at her last post, but all attempt to smother the past, leaving it hidden, waiting to be discovered. The story is gentle but compelling, beautiful and sad and as filled with quiet pathos as one of Isabelle Dashell's photographs of Annie Phelan. I thorough recommend this to any lovers of historical fiction who are after something beautiful to fill your winter nights. To buy it, click here (Amazon UK) or here (USA).